Over the weekend I got to shoot the 8th Annual Halloween Party in my Baldwin Park community. For those who don’t know, I am a regular contributor to Baldwin Park Living Magazine so I often shoot events for the publication. I’m really happy with the way the shots turned out. I know I’ve done a good job when I have to do minimal processing on the photos; some lens correction and sharpening, maybe some white balance adjustment and done! But what I’m most happy about is what I learned. I’m the kind of person who kicks myself for making a mistake or not having thought of a better solution at the time. Same goes for this shoot, but at least I can look at it and learn. Here’s the set-up: the event ran from 6pm to 8pm, so I knew I’d be losing light quickly. So I borrowed my brother’s 50mm f/1.4 lens and put it on the full frame Canon 5D. I had my 70-200 f/2.8 on my Canon 40D. You might remember from my last post, that having this lens on a cropped sensor gives me added “reach”. So for a good 30-to-45 minutes, I had enough available light to shoot with my zoom lens; great for isolating kids’ faces. When I wanted a wide-angle or started to lose light I switched to the 50mm. I love to shoot in manual mode because it gives me total control. But I realized after shooting the 2nd Annual Dog Wash that by the time I adjusted my settings I would lose the shot. So perhaps manual mode is best for situations where you can take your time. But for fast-moving events, like this one, I chose to shoot in Aperture priority and set my aperture to 2.8 almost all the time (to make sure I got as much light as possible and get a nice depth of field). I know I shouldn’t hand-hold anything slower than 1/60th of a second, so when I saw my shutter fall below that, I just boosted my ISO. Here’s where the lesson comes in. At one point I wanted to get a shot; so I was changing the ISO on my camera and by the time I looked up, the shot was gone. What I should’ve done was just to set the ISO to “auto”. In retrospect, I could’ve even shot in shutter priority to make sure I never fell below 1/60th. Lesson learned; and it’s a simple one too. I found that the 50mm on a full frame body produced vignetting as seen in the picture above. I removed it using Photoshop’s lens correction, but then decided I kind of liked it; which is weird ’cause I hate it when people add vignetting to their images. But in this case, it’s natural caused by the lens on a full frame body. Overall, I was happy with the majority of the shots. You can see the rest of the pictures in my Baldwin Park gallery. Thanks for stopping by! I Found 4-Million Dollars at the End of a Rainbow! So I was driving home from the gym the other day and I saw a rainbow in the sky (albeit a faint one). I remember reading in a Scott Kelby book or blog that to really get a good rainbow shot it has to be in the context of something visual…think, a rainbow over the Eiffel Tower or some stunning landscape. Don’t just shoot the rainbow. Shoot it in relation to something interesting. So I followed it as I drove into my community looking for something to include with my rainbow. It led me to a house I’d been wanting to photograph for some time. It’s called the “Tradewinds” house in Baldwin Park, Florida and it’s been on the market for as long as I’ve lived here. It started at close to 5-million. Now it’s a steal at around $3.9 million! Just goes to show there really is a pot of gold at the end of a rainbow. This is just a quick teaser on a photo shoot I did yesterday for one of the covers for the June issue of Baldwin Park Living Magazine. Yes, I said one of two covers…I’m shooting the other on Sunday. There are two meteorologists who live in Baldwin Park; Jason Brewer, with NBC affiliate WESH lives on my street. Brian Shields works for the ABC affiliate, WFTV (turns out Brian lives near me too). I had two concepts in mind: the first was each of them toasting the other with tropical drinks, complete with little umbrellas. The other concept was the “sad-face-happy-face” of the drama masks. 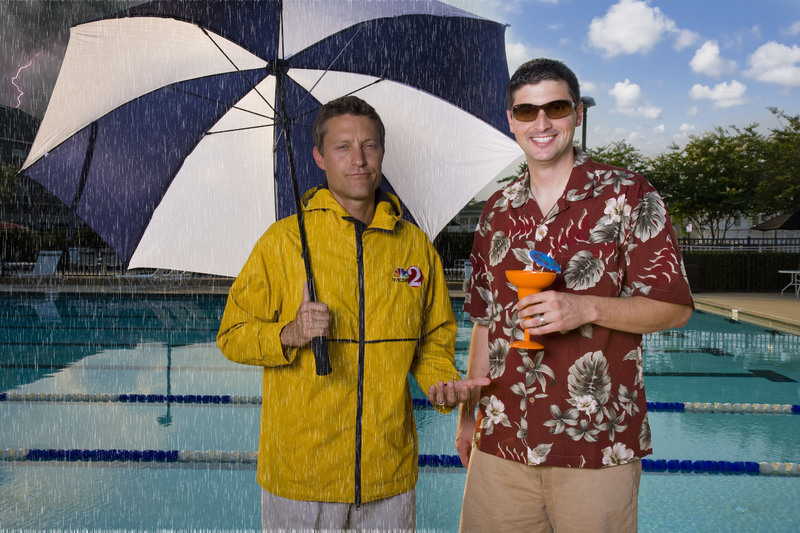 So I had Jason put on a rain coat and umbrella while Brian smiled with his shades on and his drink in hand. The original picture I submitted to the editor would have cropped out the lightning in the upper left hand corner. So I made it rain on Jason instead. I’ll post the actual cover when I get the issue, but it’s basically cropped in on the sides to their elbows. Hi, I’m An Artist. Please Don’t Look At My Work. My last blog post was about copyright. I was planning to next write about “creative commons” license and why sometimes you might actually want to have your picture “stolen”. I’m still planning on writing about that, but something happened yesterday that kind of goes along with that concept. The Baldwin Park Arts Festival took place Saturday, March 13. As a photographer for Baldwin Park Living Magazine, I have an understanding with the editor to document as many events as I can for the publication and the community Web site photo gallery. He turns around and says, “Thanks for the exposure.” I take a second to figure out if he’s making a photography pun. I decide he’s not and tell him I’m with Baldwin Park Magazine. He says thanks again. Ok, so now I’m warming up. I’ve taken a few pictures at this point when I see a girl with some money in her hand. This would be a great opportunity to get a shot of a sale. I spent almost a decade in broadcast news and I know that photojournalism is about telling a story; and isn’t the whole idea of this thing for artists to sell their work? I mean, it’s not a gallery exhibition. Let’s face it, if no one buys anything today, the event is a failure. This is literally “the money shot”. I realize I didn’t compose properly; cutting off the girl’s head and getting an arm in the shot. So I recompose and I’m waiting for the right moment when the lady whose arm is in the shot turns around and says “no pictures please”. I tell her I’m with Baldwin Park Magazine and she says the artists don’t want pictures taken. I explain to her that this is a public area and that I have the right to take pictures. We go back and forth for a few minutes and I walk away. First of all, I wasn’t taking pictures of the art work; some kind of jewelry I suppose. I was taking a picture of the transaction. Secondly, the picture is for editorial, not commercial use. Third, as a former journalist I know all about expectation of privacy and fair use. Lastly, if you don’t want your work seen, then stay home, don’t display your work in public or on the web and pray to god that someone finds your art. Is the fear that I’m going to go home, study the picture and copy the creation? Hey, I get it. I’m a photographer. Everytime I post a picture online, be it my web site, Flickr or Facebook, there’s a chance someone will “steal” it. But there’s also a chance that someone who’s never heard of me will see my work. To protect myself, I take steps to guard my copyright. But I don’t take pictures so I can stuff them in a lock box. Isn’t that the proverbial ostrich with its head in the ground? Again, the artist comes up to me and says “no pictures”. I tell him who I am and he says it’s ok. I asked him why I wouldn’t be allowed and he says, “with a camera like that, people can make good copies”. Ok, so I guess the thinking is that I’m going to sell a picture of his work? And would it be ok if I took a picture with, say, an 8 megapixel point-and-shoot? Couldn’t I make a good copy with that? What if I wanted to take a picture of someone with the art in the background? Would that be offensive? This reminded me of a similar event I attended last year. A photographer had a booth set up and his pictures featured black and white images of statues. I thought, wow, that’s interesting. He didn’t sculpt the statue, he just took a picture of it and is selling it. That issue is actually at the center of a lawsuit. You can read more about it at the Photo Attorney Blog. That case is a little different because I am there strictly for editorial reasons. Taking a picture of your art does not violate your copyright. What I do with that picture may or may not. Bottom line: That first guy got it. He thanked me for the exposure. He took a look at my DSLR and assumed I was with some media organization before I even told him who I was. The pictures I take will be featured on a magazine spread that goes out to tens of thousands of Baldwin Park residents. What’s that you say? You don’t want free advertisement? So now I want to hear from you. What do you think?